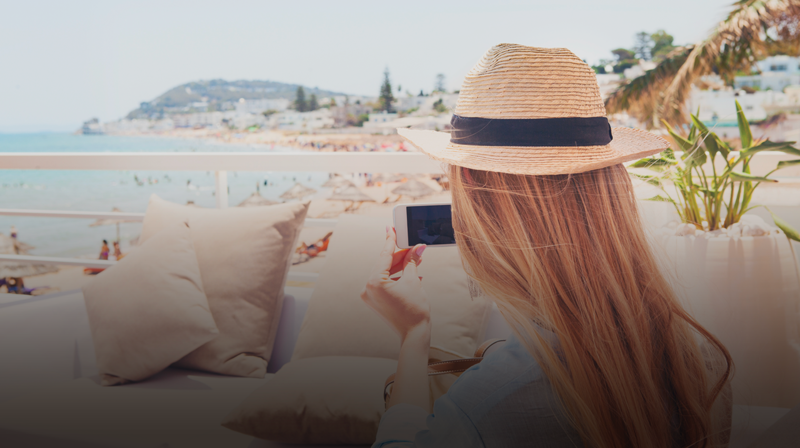 In this post, GlobalWebIndex's Strategic Insights Analyst, Olivia Valentine investigates the way social media impacts consumer choices when it comes to booking holidays, and how travel brands can make the most of their social media presence to engage audiences online. With millions of holiday-goers willing to share holiday snaps and travel experiences online, social media has become a holiday browsing hotspot and commentary hive to inspire travellers globally. With around 8 in 10 social media visitors going on a domestic or overseas holiday at least once a year, there are lots of decision-making consumers at travel marketers’ fingertips. There’s no shortage of user-generated content (UGC) on social media that keeps friends and family updated and allows users to save a snapshot of their experiences; two thirds say they post about their holiday on social media, with 4 in 10 posting whilst on holiday. This is having a huge impact on holiday-goers’ decisions. 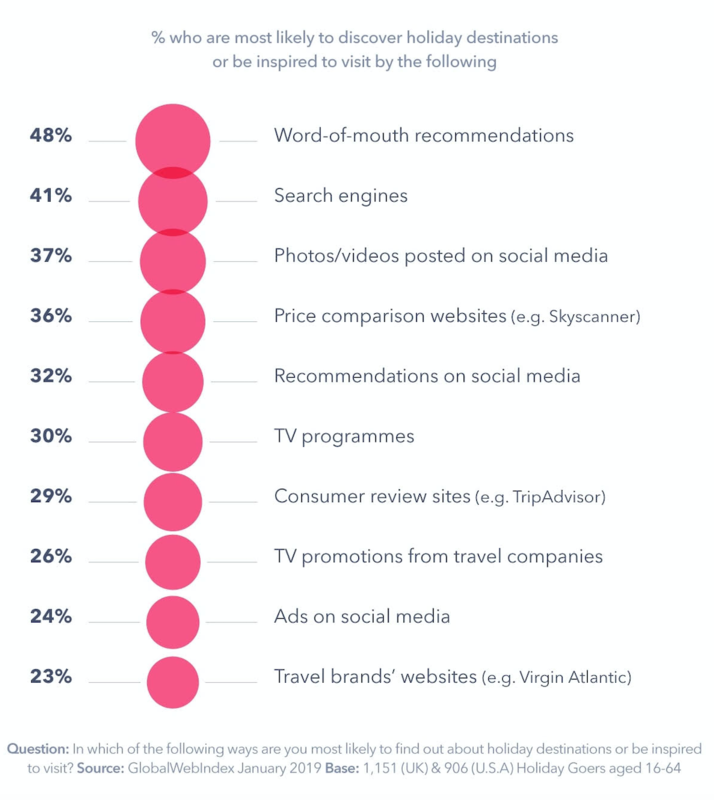 Consumers are actually more likely to discover travel destinations through the content their peers are sharing on social media - whether that’s photos/videos (37%) or recommendations (32%) - than they are via branded travel ads (24%). When we asked how they research potential destinations, falling just behind asking friends and price comparison websites like Skyscanner, social media emerged ahead of review sites, like TripAdvisor, and travel brands’ own websites. A third agreed that social media content influences their destination choices more so than content seen on TV, in print media or elsewhere online. User-generated content is still a win-win for holiday makers and brands. The brands’ experiences and destinations on offer are showcased free-of-charge, and consumers share themselves at their best on their own feeds. South African Tourism tapped into this strategy well by inviting international travellers to participate in their #meetsouthafrica campaign on Instagram, where travel bloggers set out to cover all nine provinces of the country. The hashtag has generated more than 350,000 posts to date. As travelling is far more accessible than it used to be - in part thanks to the digitalisation of the industry - marketers aren’t just targeting the affluent anymore and knowing exactly what will capture attention could really make the difference. 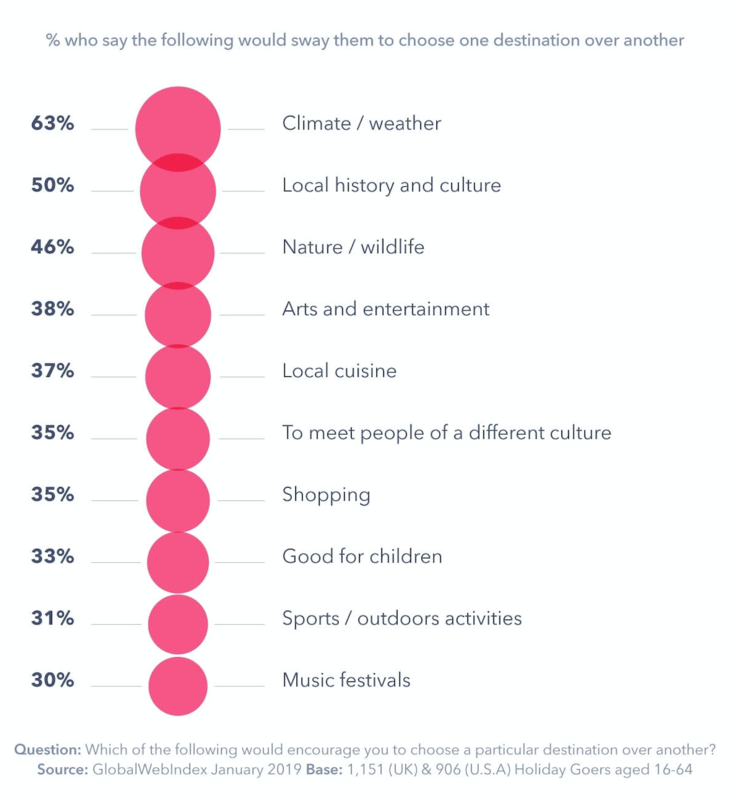 When we asked holiday-goers what would sway their destination choice, it’s not surprising that climate/weather came out on top, especially among UK respondents (68%). Beyond this, the local history and culture of a place was very important for half of consumers. Travel brands may be playing it too safe with shots of familiar destinations or landmarks. Instead, showcasing the local life and experiences unique could be the persuading point – especially among a new generation of travellers who want to learn about cultures, rather than seek the sun. The success of Airbnb Experiences, which offer one-of-a-kind activities designed and hosted by locals, affirms this new travel trend, too. For social media, UGC is the obvious option here, as travellers themselves are naturally more likely to be posting content that feels genuine and reflects the destination most accurately. Working with influencers can be another great way to ensure authentic and high quality content – and with guaranteed impressions – especially as travel is one of categories where influencers are most influential. But being transparent about paid partnerships is essential, and brands need to choose their partners carefully, and even more so when you’re marketing a costly holiday or experience. Instagram’s format naturally lends itself to travel content - #travel is included in 363m posts on the platform - but Facebook is still the go-to for the majority of holiday-goers to share content when they’re away (58% vs. Instagram at 43%). 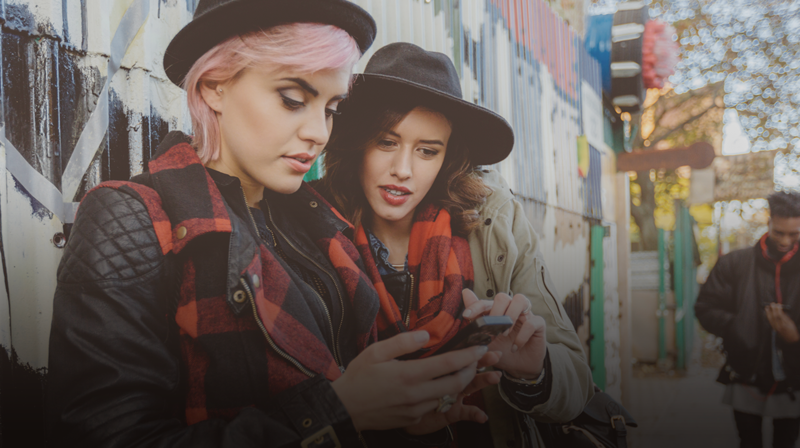 For 16-24s, Instagram just takes the lead. Travel brands’ social presence or initiatives across the platforms should ensure they’re not missing out on ways to connect with all audiences. WhatsApp falls next in line when we asked these holiday-goers where they were sharing their content, giving a small insight into dark social sharing. The implications of this invisible sharing for marketers is that while they may be less able to track what consumers are saying about holiday destinations in private messaging; the likelihood is that your brand’s content is probably getting shared far more than you might think. The world of dark social is still relatively unclear but creating content tailored to encouraging would-be travellers to share it with friends across these dark platforms - such as reviews of unique local experiences or the most breathtaking (and Instagramable) sights to see - could prove a hugely effective way for travel brands to boost their engagement with audiences online. Alongside the challenge of keeping up with the developments that new technologies, AI and chatbots are bringing to the travel industry; it is now more essential than ever for marketers to get the most from their brand’s social presence. Consumers don’t just want to see holiday or travel-based ads. Instead, to stand out, travel marketers need to think outside the box, delivering authentic and easily-shareable content that showcases what a destination truly has to offer.